One of the most common known microbe of interest to the public and scientists equally is MRSA. It has been so deeply engraved in to the medical literature that it needs no introduction. If you are connected to medical microbiology you would know that, MRSA is a genetic output of a gene called MecA gene, sitting inside a gene cassette called Sccmec element. But many probably don't know there are variants, the most well known is called MecC which also manifests as MRSA phenotype, but doesn't lend itself to easy identification in the clinical laboratory. Table 1: Mec gene variants. A strain called S. aureus isolate, LGA251, was first isolated in study of bovine population which showed phenotypic resistance to cefoxitin but latex agglutination PBR2a and MecA- PCR negative, despite repeated tests. On sequencing, a novel gene which was just 69% genetically similar to MecA was identified. The new variant was referred as MecA-LGA251. Subsequently reports emerged on the presence of this strain from multiple regions and retrospective sample search identified from a Danish blood, 1975. As per the current consensus, the MecC lies in a novel cassette XI SCCmec. The first question is why not MecB? MecB is identified in Macrococcus caseolyticus as a variant from MecA. See Table 1 for list of variants known. There is no clear evidence on origins of MecC gene. The gene has been isolated from Staphylococcus stepanovicii, Staphylcoccus scirui and a variant tentatively called MecC1 isolated from SCCmec IX-like element in Staphylococcus xylosus. The MecC gene (Also called as Class C) contains MecA and truncated MecR1 due to insertion of a IS431 upstream of MecA, and hyper-variable region and IS431 downstream of MecA. Based on the symmetry of insertion, two distinct class C mec gene complexes are recognized. Class C1 Mec gene complex, the IS431 upstream of MecA has the same orientation as the IS431 downstream of MecA, while in the class C2 Mec gene complex, the orientation of IS431 upstream of MecA is reversed. C1 and C2 are considered to have probably evolved independently. IS431 is a member of staphylococcal insertion sequence-like element and is constantly associated with Methicillin resistance. 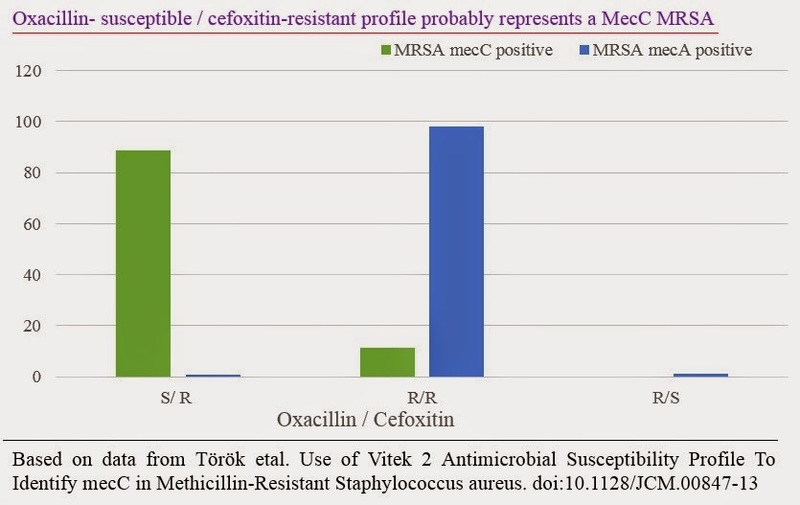 In a study by Torok etal; of 62 MecC MRSA isolates 88.7% were susceptible to oxacillin but resistant to cefoxitin (S/R), 11.3% were resistant to both oxacillin and cefoxitin (R/R), and none were susceptible to both antimicrobials. Based on the finding it was projected that Oxacillin Susceptible/ Cefoxitin resistant profile probably represents a MecC MRSA. Considering the current data, with an expected MecC S aureus is less than 4%, the positive predictive value of identification based on antibiotic disc screening is very low (less than 50%). Hence the current recommendation is testing for Mec gene using universal Mec primers which can pick multiple Mec gene variants. Methicillin resistance is now an old and almost a universal phenomenon in S aureus. The arrival of new varieties represents new challenges in terms of diagnostics. This blog post is just a primer to keep you thinking, how many more flavors of Mec could be out there.